The theme when planning our meals this week was “use up what we have.” While I need fresh produce on a weekly basis, pantry staples like beans and grains have a much longer shelf life, and also a tendency to be forgotten once their role in a particular recipe is over. I was brainstorming ways to use up some pinto beans, which I had purchased a very large quantity of when my grocery store was selling them for $0.30/lb (! ), and some masa harina, the type of flour used to make tortillas and tamales. I had a bag of this from when I made tamales back in May. I was thinking I could make tortillas with it and turn these into quesadillas to serve with some refried beans. Simple and easy, right? Maybe too simple for me- it sounded boring. What if I stuff the tortillas with cheese before cooking them? Now that sounds more like a fun dish! I sauteed a diced jalepeno with some sliced green onion, mixed it with some chevre, tucked this inside two uncooked tortillas, and cooked this on a pan with a little olive oil. 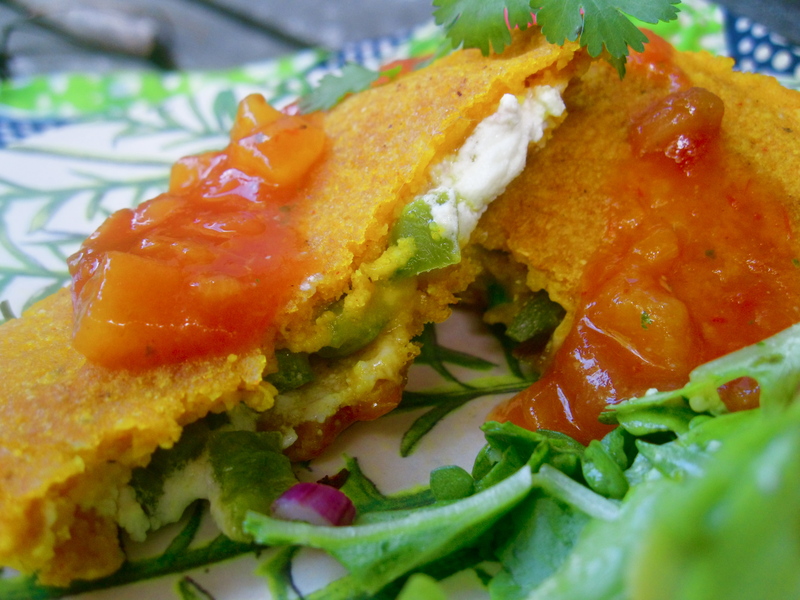 What a fun new twist on Mexican food! 1. To make the dough, combine dry ingredients in a medium bowl and mix with a fork. Pour in the 3/4 cup of the hot water and olive oil and mix with the fork. The dough should hold together but not be too sticky. You should be able to form a little ball in your hand with out it crumbling too much or sticking. If it crumbles, add a little more water, slowly, until the desired consistency is achieved. Divide mixture into 8,10, or 12 equal portions and roll into balls. Cover these with a damp cloth while you prepare the filling. 2. Saute the minced jalepeno and the white part of the green onion (reserve the green parts) in the olive oil until softened. 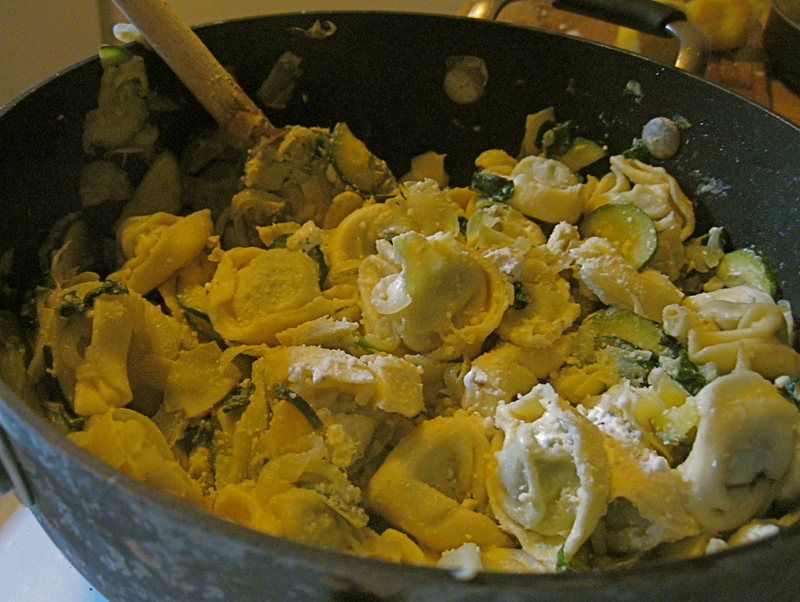 Tranfer to a small dish and stir in the green parts. 3. On a sheet of waxed paper, flatten the balls of masa dough into disks, about 1/4 inch thick. You can use you hands to do this, but if you own a tortilla press, you could use this too, just be sure not to flatten them as thin as a traditional tortilla. Divide the chile-onion mixture equally among half of the masa disks, then top with about 1.5- 2 tablespoons cheese each. Cover the filled halves with a plain masa disk and press the edges to seal. 4. Heat a large skillet over medium-high heat and coat with cooking spray or a teaspoon of olive oil. Transfer 2-3 filled tortillas to the skillet (depending on how large your skillet in and how large your tortillas are) and cook about 4-5 minutes on each side, or until crispy and golden brown. Transfer to a plate lined with a paper towel while you cook the second batch. Serve with salsa, cilantro pesto, guacamole or sour cream. 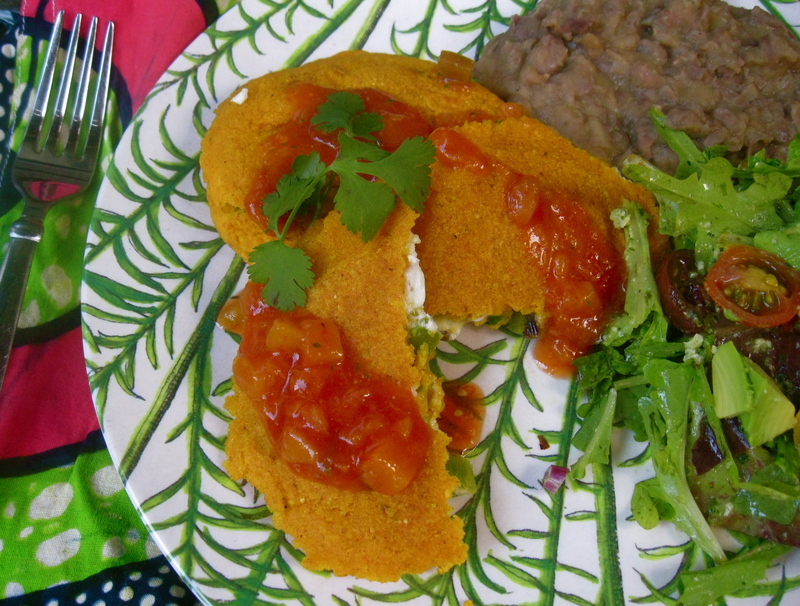 Round out the meal with a side of pinto or black beans and a fresh green salad. Look at that color! 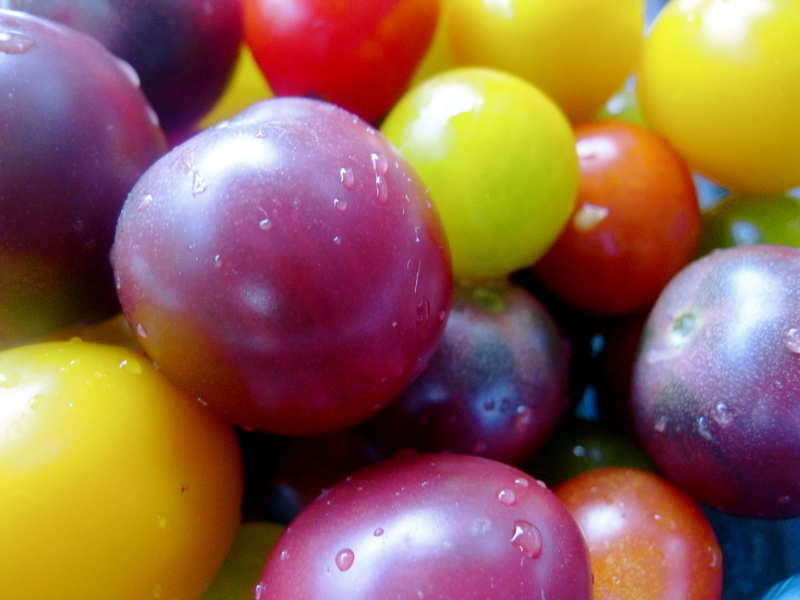 If you haven’t tried heirloom tomatoes, they are worth seeking out! I think they tend to be more flavorful than many conventional tomatoes today, and they are definitely nicer to look at! I went to the grocery store a couple days ago for a bit of lettuce. When I saw these, I stopped in my tracks! I hadn’t tried fresh figs until a couple years ago. You can only get them fresh a few months out of the year, which adds to their appeal. They are a rare treat and a delicate fruit. They bruise easily and don’t last long, but that only makes them seem more precious. They are a great source of fiber, and a good source of potassium, manganese, and calcium. But I would eat them even if they weren’t! 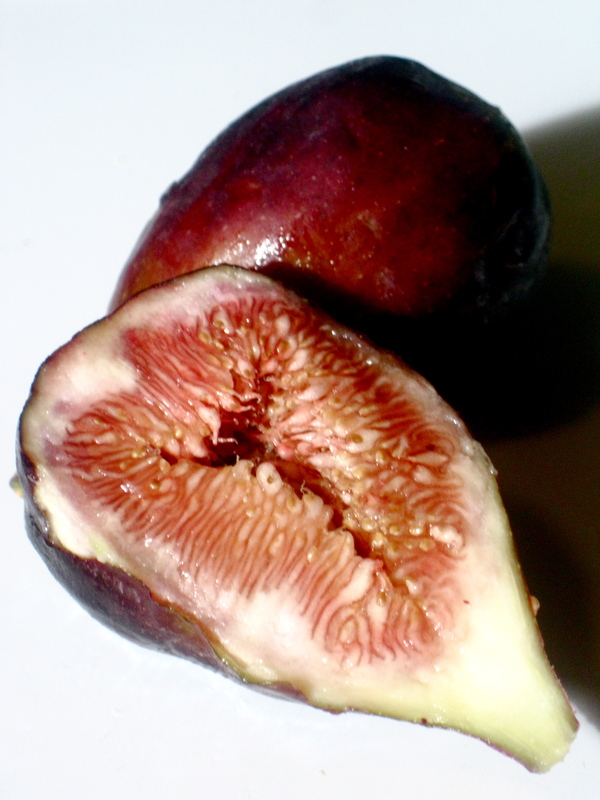 There is something so seductive about figs. Its not surprising they have been the subject of so many myths. Figs trees are in many depictions of the Garden of Eden, and the leaves were what Adam and Eve were said to have used to cover themselves. Romans held the fig tree to be sacred because the she-wolf who suckled Romulous and Remus did so under a fig tree. 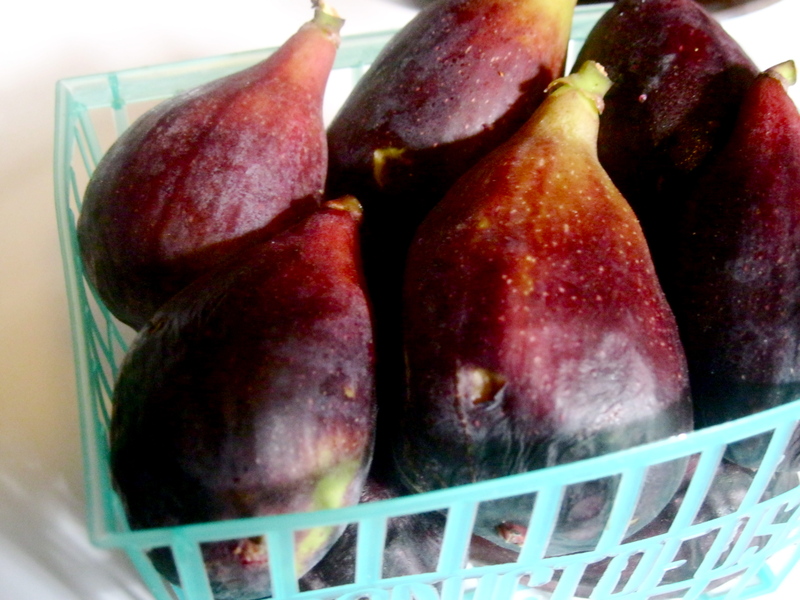 Figs are associated with Dionysus, the God of wine, and Priapus, a satyr who symbolizes sexual desire. Even the bodhi tree which Buddha is said to have achieved enlightenment under is a type of fig tree. 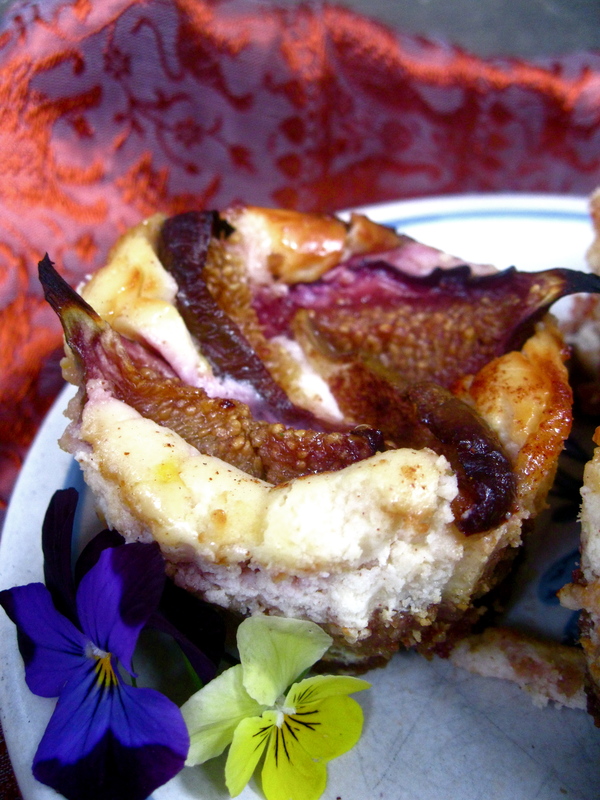 These combine two of my favorite things: Figs and goat cheese, which incidentally are a lovely combination! I made them in muffin tins because mini things are just cuter and it also helps with portion control! They are even gluten free, utilizing a simple crust of walnuts and dates. I tried to drizzle them with honey before baking, but I’m going to recommend not doing that because it made them very sticky and difficult to get out of the muffin tins! 1. 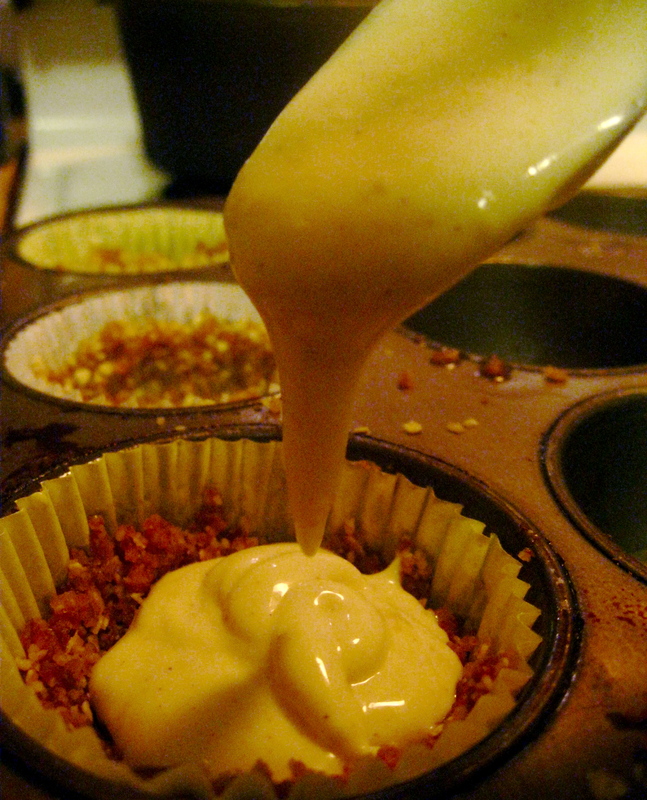 Preheat your over to 350F and prepare 6 muffin cups by either greasing them or placing paper muffin cups inside. Make the crust by pulsing the walnuts, oats, dates, and salt in a food processor until a crumbly mixture forms that will hold together if you roll it into a ball. Divide the mixture equally among the muffin cups, pressing against the bottom and up the sides to form a crust. 2. Make the filling by combining all filling ingredients in the food processor until well mixed. Spoon this mixture into the prepared muffin cups. Try not to eat it all before it gets there. 3. Now prepare the figs: Slice the figs into 4-6 pieces each. Heat the honey up on the stove or in a microwave until hot and completely liquid. Toss the figs in the honey and let marinate for a few minutes. When they have soaked up that honey goodness, spoon them over your prepared mini cheesecakes, careful not to drip a lot of honey down the sides. Sprinkle with cinnamon. 4. 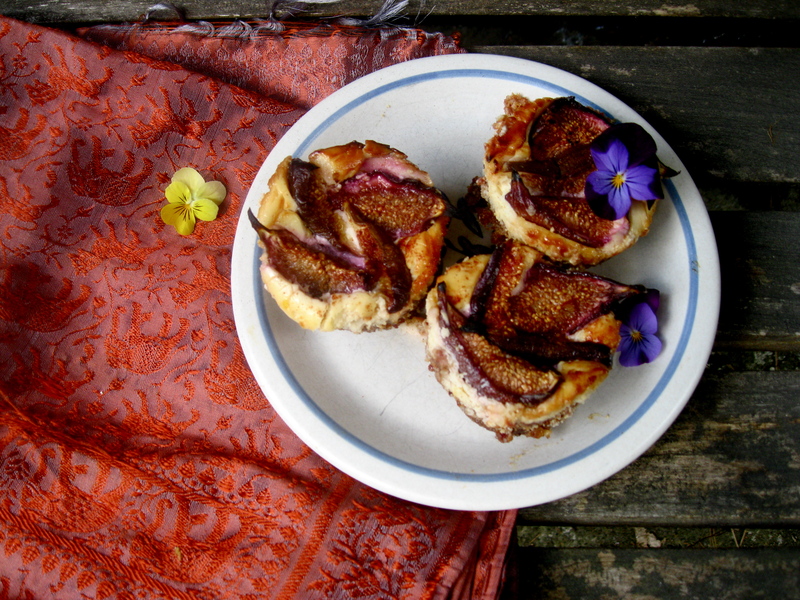 Bake for 20-22 minutes, then broil for just a minute to ensure caramelization of the figs. Cool for 3 hours or more before serving. Enlightenment is not guaranteed, but they do pair well with Harry Potter Fever! Anyone seen the last Harry Potter yet? I did! Loved it!